Generally speaking, only local residents can get married with a Catholic rite on the island of Capri. one of the couple had one or more sacraments celebrated in the parish in which the couple wish to celebrate the marriage. Paperwork (which includes, among other things, the baptismal and confirmation certificates) issued by the bride and groom’s Diocese with the related Nulla Osta within 6 months of the proposed wedding date. In addition to this, a strong bond between the couple and the island is necessary. For this reason it is required to send a request at least 6 month before the proposed wedding date, to the parish and to the Curia. The Curia, through the Wedding Office, will evaluate the pastoral reasons and necessary conditions for a possible authorization of the celebration and will communicate a decision within 1 month of receiving the request. Once the request has been accepted, the Diocese requests that the engaged couple meet at least three times with the local parish priest where they intend to celebrate their wedding. The couple will also have one or more meetings with the Wedding Office to verify the completion of the investigation (in Italian we say istruttoria) and for the documentation to be produced. In the case of requests from the engaged couple living abroad, the Wedding Office of the Italia Curia must receive the documents at least two months prior the wedding. These documents must be accompanied by an Italian translation authenticated by the competent authority. In the case of the bride and/or the groom don’t speak Italian, the couple will have to ensure, for the legal validity of the celebration, the presence of a marriage officiant who knows the language of the spouses. Catholic weddings in Italy can be legally binding (matrimonio concordatario), and the ceremony last about 1 hour and 15 minutes. The celebrations are free of charge, but spouses are encouraged to offer donations to support the needs of the parish. No weddings are celebrated during religious and local festivities, Sunday, or during the Easter period. Mixed religion weddings are allowed only if approved by a Parish Bishop. 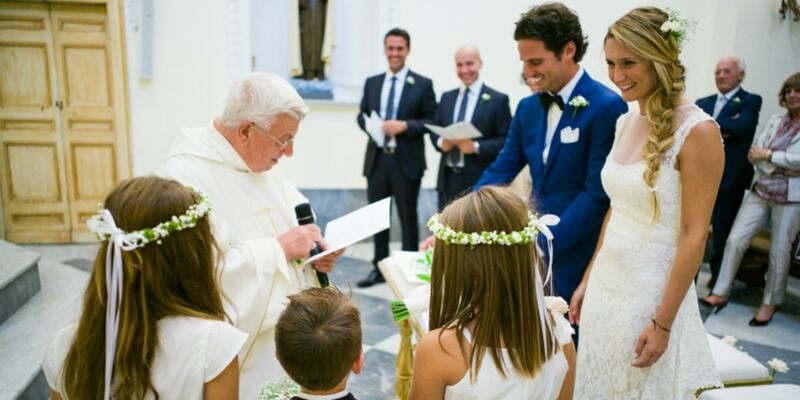 Important: for more information about catholic wedding on Capri, we highly recommend dealing directly with the parish of Capri or Anacapri and the Archdiocese of Sorrento – Castellammare (which includes Capri island) because they prefer to have direct contact with the couple. Wedding planners, friends, and relatives are not able to serve as intermediaries. We can craft a very exclusive wedding in Capri, combining the best venues with vendors that will care about your wedding as much as we do.